Tetrads move onto the screen from the left and fall to the right. Shoot squares from the blocks so they fall into columns. Clear a certain number of columns to clear the stage. Don't let the blocks hit the left of the screen or the game ends. 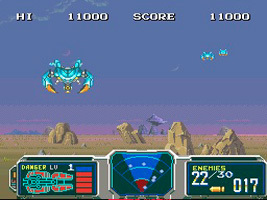 The stage starts with several coloured, blob-filled blocks at the bottom of the screen. Coloured blocks fall from the top. Shoot the falling blocks to change their colour. Create vertical, horizontal or diagonal lines of three of the same colour to clear all of the blob blocks. A variant on whack-a-mole. Shoot the little aliens when they pop their heads out of the hole. 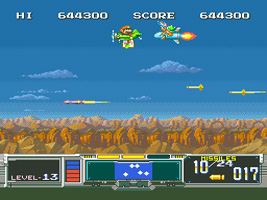 Missiles travel across the screen, and you have to shoot them down. Each type of missile travels at a different distance, and you have to take this into account when firing your missiles. Shoot the space craft and missiles out of the sky as you give chase. You are rooted to the ground as alien forces descend on you and charge up their weapons. Shoot them out of the sky before they shoot back. On the LazerBlazer game, sometimes Mario flies past in a biplane, followed closely by a Koopa Kid riding a missile. Shoot down the missile for bonus points.